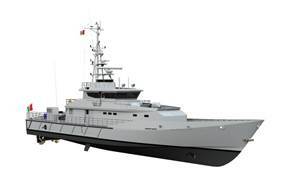 In November 2013 the Mexican Navy (Secretaría de Marina) and Damen Shipyards Group (the Netherlands) signed another contract for a Damen Stan Patrol 4207. The Mexican Navy already operates two similar Patrol Vessels and has currently two ships under construction in their shipyard ‘Astillero de Marina Numero 1’ in Tampico, which is situated on the coast of the Gulf of Mexico. The vessel is the fifth one of the Tenochtitlan-class and will be constructed by the Mexican Navy, while Damen will supply a partial material package and technical assistance. The steel for the hull and part of the piping will be acquired by the Mexican Navy. Keel laying is expected to be early 2014. The vessel will be named ‘Uxmal’, after an ancient Mayan city on the Yucatan peninsula. This project is another example of how Damen, through its ‘building on site’ programme (i.e. Damen Technical Cooperation), enables customers to build high quality vessels in their own yards, gaining experience and being able to contribute to the development of the local shipbuilding industry. This concept has proven to be successful over thirty years in five continents in different market segments.